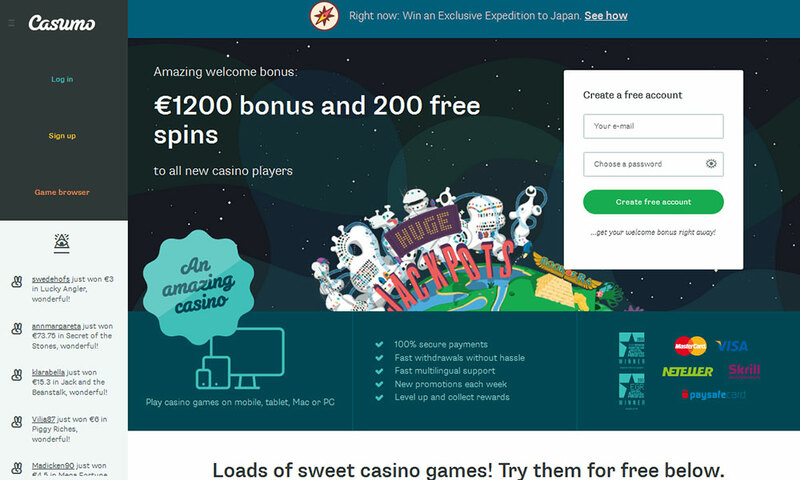 Casumo Casino - Read our review before registering! The Casumo online casino was launched in 2012, and has since attracted many players. The casino works slightly different from other casinos and offers a few special perks when playing there. You can find out more about how the casino works in this review, and we strongly recommend you check out this interesting website. Using the website is very easy. The navigation is intuitive and you can quickly find access to the games, registration page, payments and help. The casino is also accessible on mobile devices, and you can find a great range of mobile slots available for iOS and Android smartphones and tablet computers. When playing the games you do not need to download a casino software, Casumo is an instant casino and you can play all the games directly in your browser. The casino offers the games from several different developers, among them Netent, Greentube, Thunderkick, Barcrest and Williams Interactive. There are currently over 650 slots to choose from, and heaps of other games. When playing at Casumo you will start on a casino adventure. You will be awarded trophies and valuables for playing and they can take you to new levels and planets. The rewards include free games or free money and the more you play the better are the rewards. This is sort-of a loyalty program is slightly different the ones offered in other casinos. You can also see a progress bar indicating your progress to the next level. The casino also has challenges that players can complete. These are essentially tournaments that allow you to compete against other players and the best players will collect a reward. The challenges vary and you should check the casino regularly for new missions to complete. Each challenge has a leaderboard and you can see the top players there. The missions are also available in easy, medium and hard levels, and you can check the mission requirements before accepting it. You can play a mission as many times as you want, and the casino will count your best result for the leaderboard scores. At Casumo you can find the games from many different developers, such as Microgaming, Play'n Go, Greentube, Thunderkick, Netent, Bally, Barcrest, ShuffleMaster, Quickspin, Williams, NextGen Gaming, IGT, Nyx Gaming, Elk and Evolution Gaming. You can play these games directly in the browser and won't need to download a casino software. There are currently over 650 games available. The slots include some of the most popular Netent slots, such as Starburst, Twin Spin, Gonzo’s Quest and Reel Rush, and you can also play other popular Slots, among them OMG Kittens, Lady Robin Hood and Sparks. There are also classic table games available, and you can play Roulette, Blackjack, Video Poker and Casino Poker in many different versions. There are also scratch card and instant games, such as Keno and Bingo, but the focus is on the slots. There is also access to a live casino, so you will be able to play against real dealers. You can find Blackjack, Roulette, Ultimate Texas Hold'em, Three Card Poker, Caribbean Stud Poker, Baccarat and Casino Hold'em in the selection of live games. The casino also offers a huge selection of jackpot games, among them some of the most popular network slots, such as the Netent slots Mega Fortune, Hall of Gods and Arabian Nights, as well as the Netent slots with local jackpots, such as Cosmic Fortune. The Casumo welcome offer for new players is currently up to €/£/$ 1,200 welcome bonus with 200 free spins. The bonus is split over the first 5 deposits and you can get 200% up to €/£/$ 50 for your first deposit and the 200 free spins. You get 20 free spins every day for the following 9 days, and 20 free spins right after signup. The bonus for the second deposit is 50% up to €/£/$ 150, for the third deposit it is 50% up to €/£/$200, for the fourth deposit it is 25% up to €/£/$ 400, and the same again for the fifth deposit. The wagering requirements for the bonus are 25 times bonus plus deposit, which is a bit higher than with other operators. Winnings from the free spins are credited as bonus money and are subject to 30 times wagering before a withdrawal is possible. When playing with bonus money, keep in mind that only slots and some other instant games contribute to 100% to the wagering requirements and that you cannot play Roulette or other table games with this bonus money. Casumo operates with a license from the Malta Gaming Authority and from the UK Gaming Commission, and the regulatory bodies check regularly the finances of the casino to ensure that player funds are protected. The operator also uses SSL encryption for all casino transactions, and ensures to not give your personal or financial information to third parties. The casino has a great reputation among players, and you can be certain to be in safe hands when playing here. The customer support can be contacted 24/7 through email and live chat. When requesting a withdrawal of casino funds the casino aims to process the withdrawal as soon as possible, and guarantees to review them within 24 hours. Before your first withdrawal you need to verify your identity with the casino, and this usually results in the first withdrawal taking a bit longer than subsequent ones. Choosing a bank transfer will also prolong the time before you have the money, as the bank processing time can take up to three days. Faster withdrawal methods are Skrill and Neteller, and the funds are credited to your account shortly after they have been processed by the casino. The minimum withdrawal amount is €10. In conclusion we can say that the Casumo online casino is an interesting site to play at, and you can get some great offers there. The reward program is especially interesting for people who play regularly and the game selection is satisfactory. A small drawback is that the casino does not offer a live casino or 24 hour support, but this might change in the future. Overall, it is a great website that earned their trust with the players. This was also reflected in the EGR awards the operator received for their casino. Casumo is one of the best online casino great games highly professional staff fast paying withdrawals I always enjoy playing at Casumo this Casino is one of my favourite it's 100% very fair and secure and it's the best I love it.